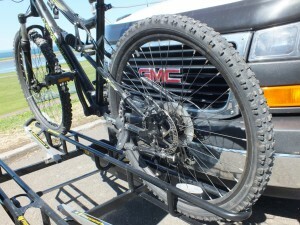 How to use bike racks? 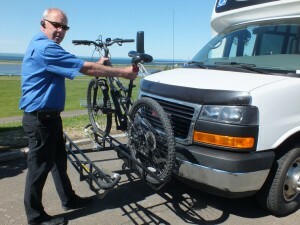 Wait until the RÉGÎM bus stops beside your bike in order to be ready when the vehicle arrives. Make sure that you have removed all accessories that are not solidly attached to the bike, such a water bottle, a bag, a cyclometer, articles in the basket or luggage rack, a child seat, etc. When the bus stops, make sure that the driver sees you and indicate to him that you wish to install your bike on the rack. Hold your bike with one hand and use the other hand to pull the bike rack handle up to disengage the safety lock and then pull the rack toward you. Lower it slowly until it is in a horizontal position. 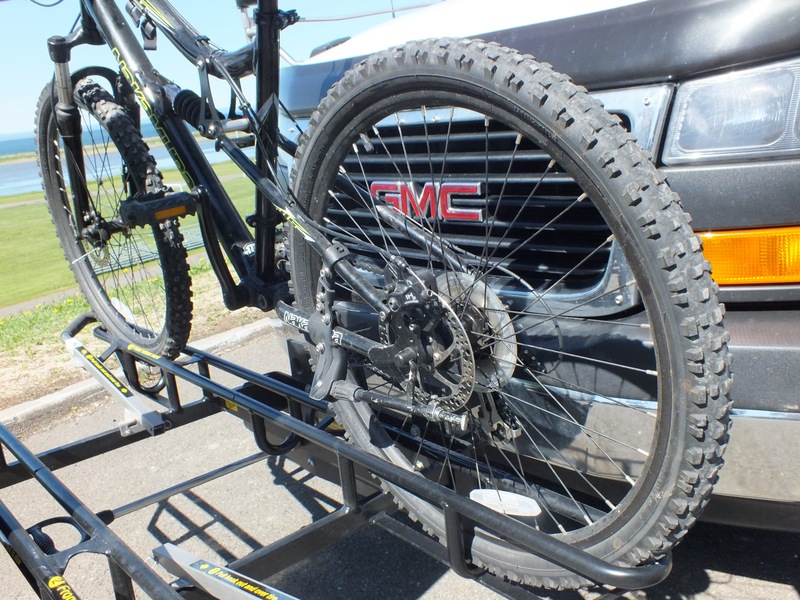 Once the bike rack is lowered, lift your bicycle and place it on the rack, while making sure that the front and back wheels are properly placed in the rails for this purpose. 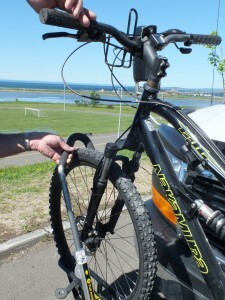 Lift the support arm up and over the front tire and make sure that it is not touching the frame or mudguard. The first bike must be placed in the slot closest to the bus. Board the bus and follow the standard RÉGÎM regulations. When you board the bus, tell the driver where you wish to get off the bus with your bike. 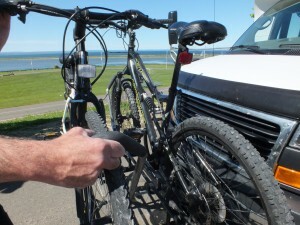 As you are getting off the bus, remind the driver that you will be removing your bike from the bike rack. 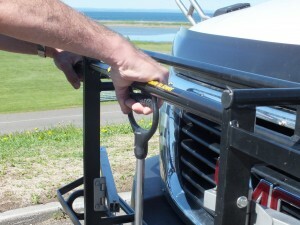 Go to the front of the vehicle, return the support arm to its upright position and remove your bike from the rack. If there are no other bikes on the rack, return it to its upright position and slowly pull on the handle until it is in the locked position. Move away from the vehicle and indicate to the bus driver that you have unloaded your bike and that he can leave. Wait until the bus has left before crossing the street or leaving on your bike. 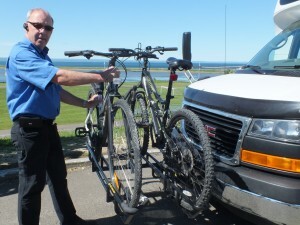 Substitute vehicles and sedans do not have bike racks. The RÉGÎM is not responsible for any bodily harm resulting from the use of a bike rack. 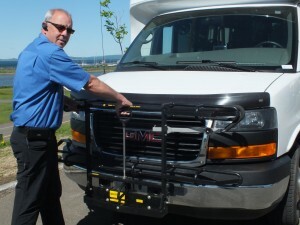 The RÉGÎM is not responsible for damages, losses or theft of a bike or its equipment during transportation or when a bike is being loaded on or unloaded from the bus rack. The RÉGÎM is not responsible for any inconvenience to persons who are unable to transport a bicycle if there is no space left on the rack or if a substitute vehicle is used. It is forbidden to a personal lock to secure a bike to the rack. 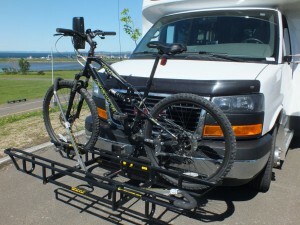 The passenger must be able to load a bike on the bus rack independently. 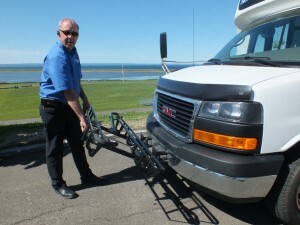 The bus driver is not authorized to assist in the loading and unloading of bikes. You must be at least 16 years of age or be accompanied by an adult. Do not attempt to place a third bike on the support if it already contains 2 bicycles. Only bicycles that are not motor-assisted and that have with two wheels are accepted. It is strictly forbidden to attempt to use the bike rack for bicycles of non-standard dimensions, unicycles, scooters or tricycles.